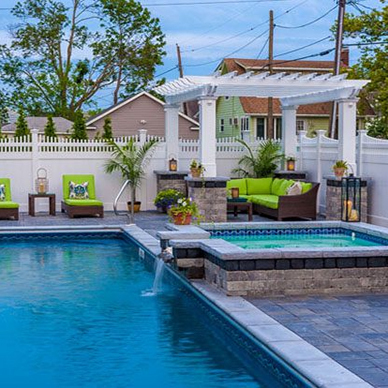 Down To Earth Landscaping, Inc. has been providing high-quality landscape services to New Jersey since 1986. For more than 25 years, our full-service approach has offered clients the benefit of receiving prompt professional services for everything from irrigation system installation to grounds maintenance to backyard landscaping. Our residential and commercial divisions offer a full range of landscape design, landscape construction, horticultural maintenance, and irrigation design and installation, so contact our landscaping company today no matter what you’re in need of. With full crews working in each of our divisions, our full-service approach offers clients the benefit of receiving prompt, professional services for everything from sprinkler system installation to grounds maintenance to mowing services — all with a single call. We’re happy to work with you on your project and we look forward to hearing from you. Let our landscape designers and architects create a uniquely beautiful landscape for the place you call home. Whether it’s backyard landscaping or front yard landscaping, you need help coming up with landscape design ideas, or you need other landscaping services, we can help. We have more than 25 years’ worth of experience in providing landscape services to developers, general contractors, and municipal/state/federal agencies.